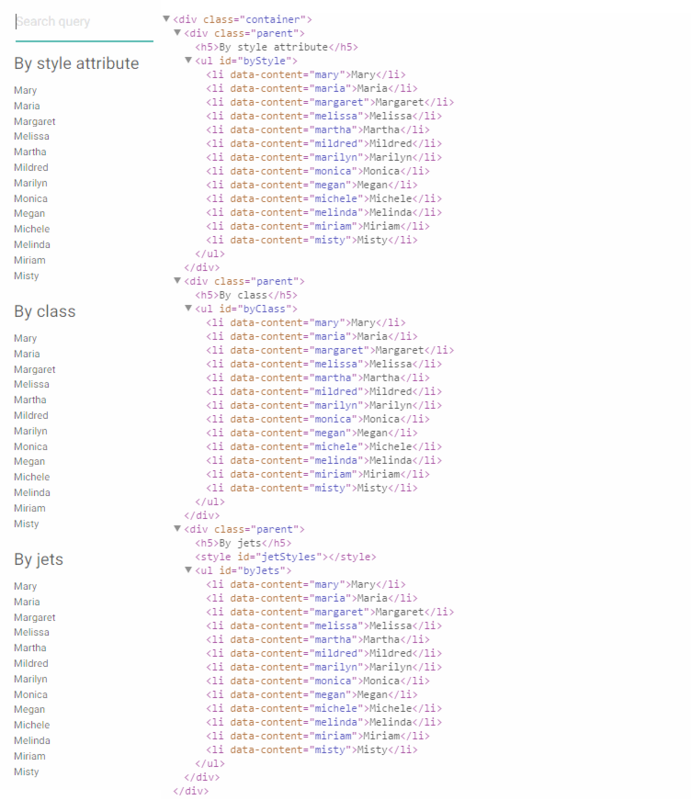 Imagine a situation - your HTML markup renders at backend side, it contains some list of data. At one point you need to implement search by this list. It can be easily achieved by using Jets.js with a browser's native search speed. The main idea is not to affect attributes of each tag in the list while filtering. Instead apply dynamic CSS rule in only one <style> tag and browser will decide which item of list to show or hide. Since it's just CSS - Jets.js may be applied to any tag, whether it's a table or UL, OL, DIV… Search term may be set using text field, select or even programmatically. p.s. how execution measures were made? searchTag It depends Selector for search input tag. Refers to document.querySelector(). If true - will add separate attributes (data-jets-col-0="first column content") of each column content, which then may be used for specific column search by calling .search('search phrase', 0). To use this option, callSearchManually must be set to true. .update() Boolean Updates "Jets attributes" which used for search. This method should be called after adding new items to the list or changing values of some of them. By default .update() would process only rows without "data-jets" attribute for performance reasons. So if you've added new rows, .update() will process them cause they don't have "data-jets" attribute yet. If you have changed content of some rows, remove their "data-jets" attributes and call .update(). If you need to forcibly update all tags in spite of everything, set parameter as true. .search() String, [Number] Triggers search. May be useful in pair with callSearchManually option. If search phrase specified by attribute .search('phrase') it will be used, otherwise .search() value will be taken from searchTag. This map will find "Larson" in the list by typing "Łąřśøń" and vice versa. Will find [Mikki Doe] in [Mikki Rurk, John Doe, Mike Vazovsky, Mikki Doe] by search phrase "Doe Mikki" or even "Do ikki"
Will find [Mikki Rurk, John Doe, Mikki Doe] in [Mikki Rurk, John Doe, Mike Vazovsky, Mikki Doe] by search phrase "Doe Mikki" or even "Do ikki"
Beware using this with huge lists as it may be resource-intensive!